In a subsequent study, Bergstrom et al. (2014) compared growth performance and carcass characteristics of growing/finishing pigs fed diets containing 20% or 60% dried distillers grains with solubles (DDGS) using wet-dry or conventional dry feeders on a commercial farm. A total of 1,080 pigs were placed in 40 pens (27 pigs per pen) containing either wet-dry or conventional dry feeders. Diets were formulated on a metabolizable energy (ME) basis using a value of 3,420 kcal/kg for DDGS containing greater than 10% oil. Standardized ileal digestibility (SID) values of amino acids in DDGS obtained from Stein et al. (2006) were used in diet formulation. The ME and SID amino acid values for all other ingredients were obtained from the 1998 National Research Council (NRC) publication. Growth rate, ADFI, and final body weight were greater for pigs fed using the wet-dry feeders compared with the conventional dry feeders, but gain:feed was greater for pigs fed using the conventional dry feeders (Table 1). As a result, pigs fed using wet-dry feeders had heavier hot carcass weight, greater carcass backfat depth, less carcass fat-free lean and lower jowl fat iodine value than pigs fed using the conventional dry feeders. Feeding the 60% DDGS diets slightly reduced ADG and gain:feed and tended to reduce final bodyweight compared with feeding the 20% DDGS diets. Furthermore, feeding 60% DDGS diets resulted in lower hot carcass weight and backfat depth and greater carcass fat-free lean percentage and jowl fat iodine value but had no effect on carcass yield. These results suggest that feeder design can have significant effects on growth performance and carcass composition of pigs fed DDGS diets. High dietary inclusion rates (60%) of DDGS may reduce ADG and hot carcass weight but improve gain:feed and the carcass fat-free lean percentage compared with feeding growing/finishing pigs diets containing 20% DDGS. In addition to feeder design, feeder space allowance can also affect the growth performance of growing/finishing pigs. Weber et al. (2015) conducted a study to evaluate the growth performance of pigs fed 30% or 60% DDGS diets using different feeder space allowances. The ME content of DDGS was estimated using the equation from Noblet and Perez (1993), and varying amounts of choice white grease were added to achieve iso-caloric diets among treatments. A five-phase late-nursery and growing/finishing feeding program was used, with dietary DDGS inclusion rates of 27.5%, 30.0%, 32.5%, 32.5% and 26.3% in phases 3, 4, 5, 6 and 7, respectively. Dietary inclusion rates of DDGS for the 60% DDGS treatment were 30.0%, 59.9%, 59.9%, 59.9% and 30.0% in phases 3, 4, 5, 6 and 7, respectively. There were no interactions between feeder space allowance and DDGS inclusion rate, which indicated that feeder space allowance does not affect growth performance and carcass characteristics of pigs fed 30% or 60% DDGS diets during the growing/ finishing period. Furthermore, there were no differences in final body weight, ADG, ADFI and gain:feed of pigs fed the 30% or 60% DDGS diets (Table 2). However, pigs fed the 30% DDGS diets had slightly heavier hot carcass weight and greater carcass yield and loin depth at slaughter com- pared with pigs fed the 60% DDGS diets. These results suggest that the different feeder space allowances provided during the growing/finishing phase had no effect on growth performance or carcass characteristics of pigs fed 30% or 60% DDGS diets, but feeding the 60% DDGS diets slightly reduced hot carcass weight, yield and loin depth compared with pigs fed 30% DDGS diets. It is well known that feeding pelleted diets to pigs generally improves feed conversion, but achieving optimal pellet quality — as measured by the pellet durability index (PDI) — is a challenge for a DDGS diet because of its low starch and high fiber content. Myers et al. (2013) fed meal or pelleted diets containing 25-45% DDGS to evaluate how diet form as well as feeder design (conventional dry or wet-dry feeders) affected growth performance and carcass characteristics of growing/finishing pigs (n = 1,290) using a five-phase feeding program. The PDI of the pelleted DDGS diets was less than optimal, resulting in about 37% fines in the experimental diets. There was no diet form-by-feeder design interaction for ADG, but pigs fed pelleted diets had greater ADG than those fed meal diets (Table 3). Similar to the results reported by Bergstrom et al. (2014), pigs fed using the wet-dry feeders had greater ADG than those fed with conventional dry feeders. Feeding meal diets in dry feeders resulted in reduced ADFI compared with pigs fed pelleted diets, but ADFI did not differ between the two diet forms when using wet-dry feeders. Gain:feed was similar for pigs fed meal or pelleted diets using wet-dry feeders but was reduced when pigs were fed pelleted diets using the dry feeders compared with pigs fed meal diets. There were no diet form-by-feeder design interactions or differences between diet forms for any carcass characteristics. However, pigs fed with the wet-dry feeders had more backfat and a lower percentage of carcass fat-free lean than pigs fed using dry feeders. These results suggest that although optimal pellet durability was not achieved in this study, feeding pelleted DDGS diets using wet-dry feeders appears to optimize growth performance but may reduce the percentage of carcass fat-free lean. 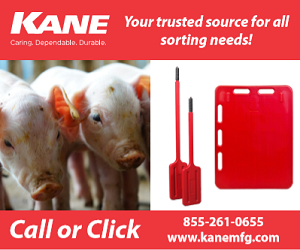 At certain times, fluctuations in DDGS price and availability may cause it to be used in swine diets intermittently during the growing/finishing phase to optimize economic returns over feed costs. To evaluate this scenario, Hilbrands et al. (2013) conducted an experiment to determine the effects of alternating diets with and without DDGS during the growing/finishing phase on growth performance and carcass characteristics using a three-phase feeding program consisting of corn/soybean meal control diets, or 20% or 40% DDGS diets fed continuously or alternating between control and 20% DDGS diets or between control and 40% DDGS diets every two weeks. There were no differences in ADG, carcass yield, backfat, loin muscle area or carcass lean percentage among dietary treatments (Table 4). Pigs fed the 20% DDGS diets continuously tended to have greater feed intake than pigs fed alternating 40% DDGS and control diets every two weeks. Furthermore, alternating between the control and 20% diets tended to result in greater gain efficiency than pigs fed the 20% DDGS diets continuously. However, when diets were alternated every two weeks between the 40% DDGS and control diets, hot carcass weight was reduced compared with all other dietary treatments. These results suggest that alternating between corn/soybean meal diets and 20% or 40% DDGS diets every two weeks has minimal effects on growth performance and carcass characteristics. Many commercial feed mills use multiple sources of DDGS with variable nutrient content and digestibility, which may influence growth performance and carcass composition if appropriate adjustments in energy and digestible amino acid contents are not made when formulating diets. In a second experiment, Hilbrands et al. (2013) obtained two sources of DDGS with low or high SID amino acid digestibility. The ME content of these sources was estimated using ME prediction equations from Pedersen et al. (2007). The SID amino acid values from these DDGS sources were derived from the IDEA assay (Novus International). Values for ME and SID amino acid content for corn and soybean meal were obtained from NRC (1998). All diets — the corn/soybean meal control (CON), 40% DDGS with low digestible amino acids (LD) and 40% DDGS with high digestible amino acids (HD) — were formulated on an SID amino acid basis and fed in four phases. Six dietary treatments were fed consisting of: (1) CON diets fed continuously, (2) LD diets fed continuously, (3) HD diets fed continuously, (4) LD and CON diets alternated by phase, (5) HD and LD diets alternated by phase and (6) HD and LD diets alternated by phase. Pigs fed LD and HD-LD had reduced ADG and lower final bodyweight compared with CON, and feeding LD resulted in lower ADFI than LD-CON and HD-CON, but gain:feed was not affected by dietary treatment (Table 5). These results indicate that the IDEA assay likely overestimated the SID amino acid content when formulating diets. Pigs fed LD and HD-LD had lower hot carcass weight, yield and loin muscle area than the other dietary treatments. However, periodic inclusion and removal of 40% DDGS from diets did not adversely affect overall growth performance, regardless of the amino acid digestibility of the DDGS source fed. Furthermore, there were no differences in the percentage carcass lean among dietary treatments. Therefore, the results of these two experiments indicate that alternating between corn/soybean meal and DDGS diets every two weeks has minimal effects on growth performance or carcass composition. Feeding DDGS diets to growing/finishing pigs using wet-dry feeders appears to result in improved ADG and ADFI, but not gain efficiency, compared to using conventional dry feeders. However, increased carcass backfat and reduced carcass fat-free lean percentage may occur when feeding DDGS diets using wet-dry feeders. Providing feeder space allowances between 4.1 cm and 5.7 cm per pig during the growing/finishing phase does not affect growth performance or carcass characteristics of pigs fed 30% or 60% DDGS diets. Achieving optimal pellet durability when pelleting DDGS diets can be a challenge. However, feeding pelleted DDGS diets using wet-dry feeders appears to optimize growth performance compared with using conventional dry feeders but may result in a reduced percentage of carcass fat-free lean. Finally, alternating between corn/soybean meal and DDGS diets every two weeks has minimal effects on growth performance or carcass composition of growing/finishing pigs. Bergstrom, J.R., J.L. Nelssen, M.D. Tokach, S.S. Dritz, R.D. Goodband and J.M. DeRouchey. 2012. Effects of two feeder designs and adjustment strategies on the growth performance and carcass characteristics of growing-finishing pigs. J. Anim. Sci. 90:4555- 4566. Bergstrom, J.R., J.L. Nelssen, M.D. Tokach, S.S. Dritz, R.D. Goodband and J.M. DeRouchey. 2014. The effects of feeder design and dietary dried distillers’ grains with solubles on the performance and carcass characteristics of finishing pigs. J. Anim. Sci. 92:3591-3597. Hilbrands, A.M., L.J. Johnston, K.M. McClelland, R.B. Cox, S.K. Baidoo, L.W.O. Souza and G.C. Shurson. 2013. Effects of abrupt introduction and removal of high and low digestibility corn distillers dried grains with solubles from the diet on growth performance and carcass characteristics of growing-finishing pigs. J. Anim. Sci. 91:248-258. Myers, A.J., R.D. Goodband, M.D. Tokach, S.S. Dritz, J.M. DeRouchey and J.L. Nelssen. 2013. The effects of diet form and feeder design on the growth performance of finishing pigs. J. Anim. Sci. 91:3420-3428. Noblet, J., and J.M. Perez. 1993. Prediction of digestibility of nutrients and energy value of pig diets from chemical analysis. J. Anim. Sci. 71:3389-3398. National Research Council. 1998. Nutrient Requirements of Swine. 10th ed. National Academy Press, Washington, D.C.
Stein, H.H., M.L. Gibson, C. Pedersen and M.G. Boersma. 2006. Amino acid and energy digestibility in ten samples of distillers dried grain with solubles by growing pigs. J. Anim. Sci. 84:853-860. Weber, E.K., K.J. Stalder and J.F. Patience. 2015. Wean-to-finish feeder space availability effects on nursery and finishing pig performance and total tract digestibility in a commercial setting when feeding dried distillers grains with solubles. J. Anim. Sci. 93:1905-1915.